College of Chemistry and Chemical Engineering, Qufu Normal University, Qufu, China. Received January 2nd, 2011; revised February 18th, 2011; accepted March 24th, 2011.
these properties, air pollution was prevented greatly. lead to water pollution because of their high solubilities. ILs released into the environments will be inevitable. These cause environmental and agricultural pollution. different reaction to ILs which shown eco-toxicity. studying the toxicity of ILs is important. ternative method in the study of metabolism of the cell. anion (as shown in Scheme 1) on Escherichia coli (E.
Scheme 1. Chemical structures of prepared Ils. constant, and t is the experimental time. rate during the whole bacterial growth. baseline stability (over a period of 24 h) is 2 × 10−5 W.
mW. The maximum sample volume is 24 mL. used as the test organism. NaCl, 2 g peptone and 1 g beef extract in every 200 mL. sure steam at 121℃ for 30 min before experiments. tions were prepared using doubly distilled water. continuous bacterial growth were recorded by computer. lized, the process of bacterial growth was complete.
) 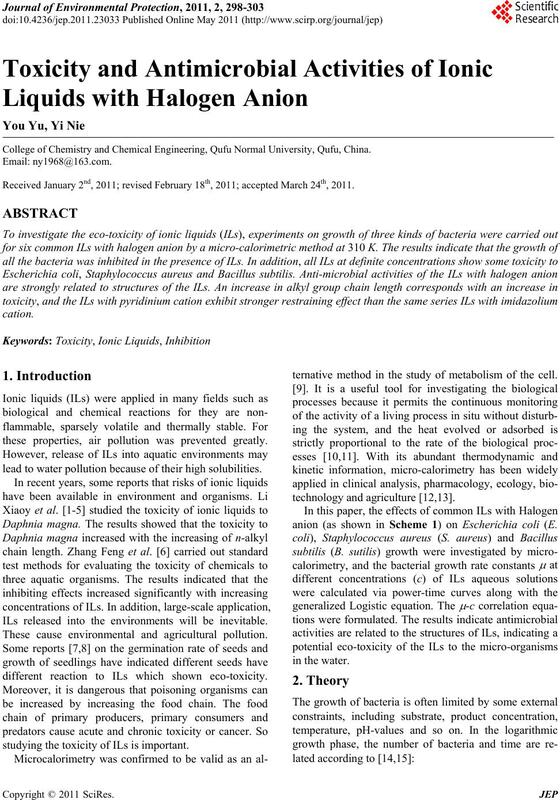 of the E. coli, S. aureus and B.
on the concentration of IL in the solution. Table 1. 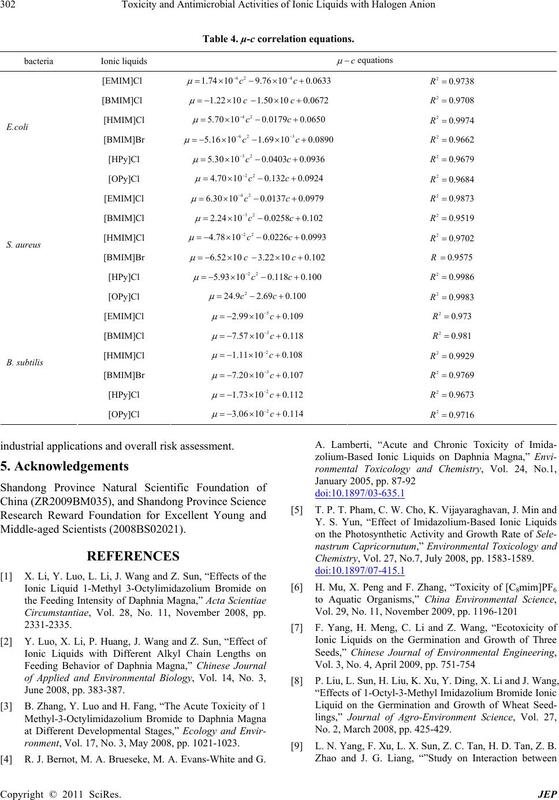 Growth rate constants μ/min−1 of E. Coli at different concentrations of ILs at 310 K.
Table 2. 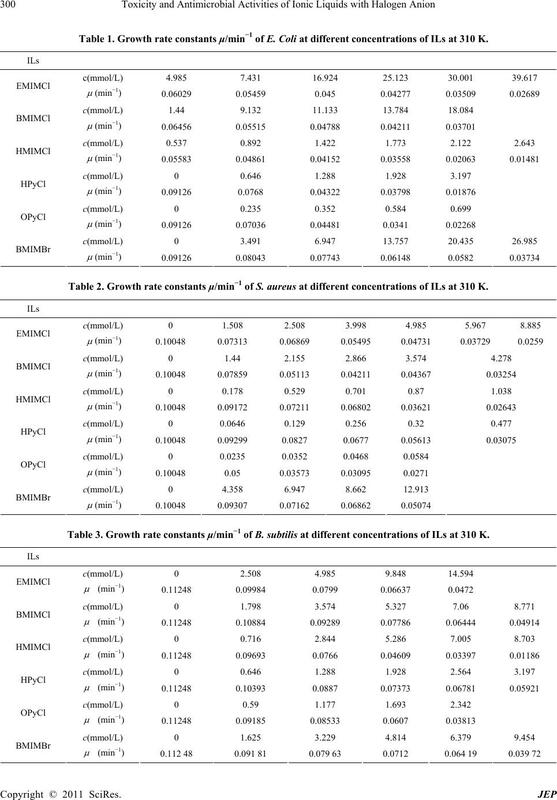 Growth rate constants μ/min−1 of S. aureus at different concentrations of ILs at 310 K.
Table 3. 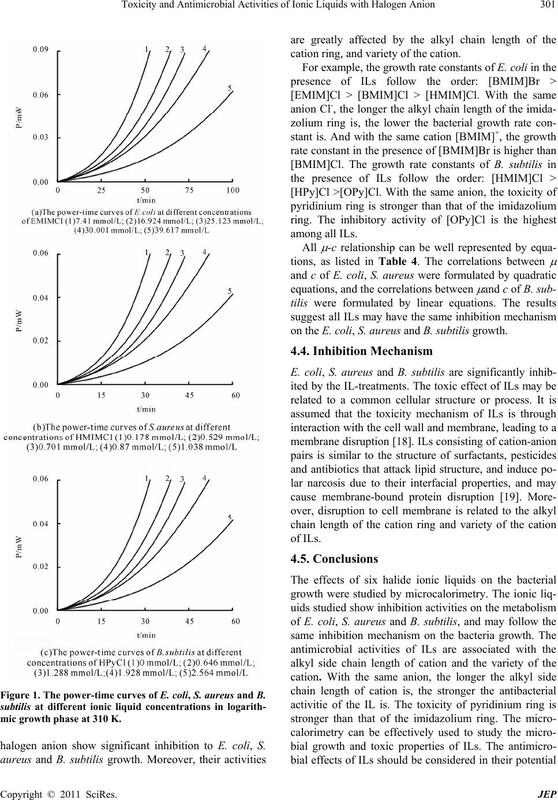 Growth rate constants μ/min−1 of B. subtilis at different concentrations of ILs at 310 K.
Figure 1. The power-time curves of E. coli, S. aureus and B.
mic growth phase at 310 K.
halogen anion show significant inhibition to E. coli, S.
cation ring, and variety of the cation. on the E. coli, S. a ureus and B. subtilis growth . Table 4. μ-c correlation equations. industrial applications and overall risk assessment. Circumstantiae, Vol. 28, No. 11, November 2008, pp. ronment, Vol. 17, No. 3, May 2008, pp. 1021-1023. R. J. Bernot, M. A. Brueseke, M. A. Evans-White and G.
Chemistry, Vol. 27, No.7, July 2008, pp. 1583-1589. No. 2, March 2008, pp. 425-429. L. N. Yang, F. Xu, L. X. Sun, Z. C. Tan, H. D. Tan, Z. B.
Calorimetry, Vol. 85, No. 3, September 2006, pp. 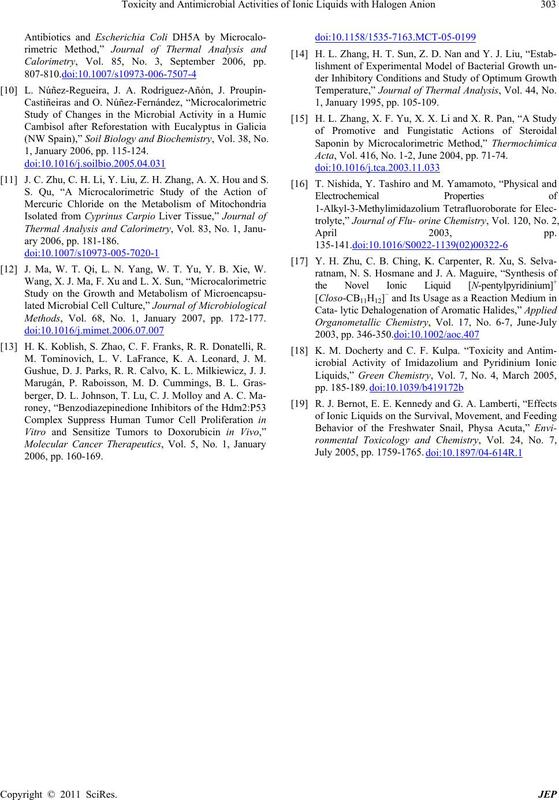 (NW Spain),” Soil Biology and Biochemistry, Vol. 38, No. 1, January 2006, pp. 115-124. J. C. Zhu, C. H. Li, Y. Liu, Z. H. Zhang, A. X. Hou and S.
 J. Ma, W. T. Qi, L. N. Yang, W. T. Yu, Y. B. Xie, W.
Methods, Vol. 68, No. 1, January 2007, pp. 172-177. H. K. Koblish, S. Zhao, C. F. Franks, R. R. Donatelli, R.
M. Tominovich, L. V. LaFrance, K. A. Leonard, J. M.
Gushue, D. J. 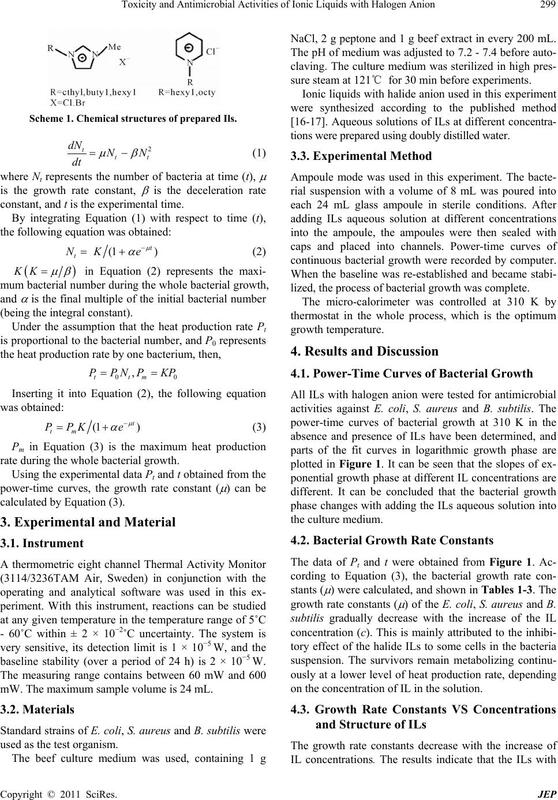 Parks, R. R. Calvo, K. L. Milkiewicz, J. J.
Temperature,” Journal of Thermal Analysis, Vol. 44, No. 1, January 1995, pp. 105-109.